The Element Gore-Tex Active Jacket from Gore Bike Wear is your primary defense against the rain. The Gore-Tex® Active fabric combines durable wind and waterproofness with enhanced breathability to keep you comfortable during hard efforts in the rain. A zippered rear stow pocket provides storage for all your ride essentials, and a second zippered pocket on the chest is the perfect spot for a phone or wallet. Cinch everything down with a drawstring at the torso and velcro at the cuffs and you're ensured to find yourself still pretty and dry when the pedals stop turning. Features a long-cut back for extra coverage and reflective accents all-around for increased visibility. Available in multiple colors. Chest 32¾"-34¾" 35"-37" 37½"-39½" 39¾"-41¾" 42"-44"
Sleeve Length 29¾"-30¾" 31"-31¾" 32"-32¾" 33"-33¾" 34"-34¾"
Waist 28¾"-30¾" 31"-33" 33½"-35½" 35¾"-37¾" 38"-40"
Hips 33½"-35½" 35¾"-37¾" 38"-40" 40½"-42½" 43"-45"
Inseam 30¾"-31¼" 31½"-32" 32½"-32¾" 33"-33½"
I bought the black Gore jacket. First use was on a 42 degree rainy ride, and wore only a short sleeve jersey under the jacket. The jacket is awesome! I had no water sneak in anywhere even on a couple 30 mph downhill blasts. Stayed warm too and did not notice any sweat condensation build up in the jacket like I have had in other jackets that don't breath well. I am tall and the sleeve length was long enough. Wish I would have purchased this jacket years ago instead of wasting my money on other brand name jackets. Does what it says it will do. 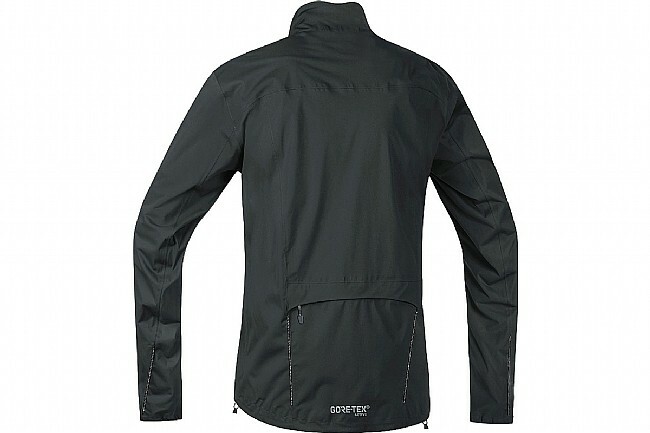 This cycling jacket is ideal for rainy and cold weather riders. The back of the jacket is long enough to cover your backside when riding as well as the extra long sleeves give your arms protection when in the tuck riding position. 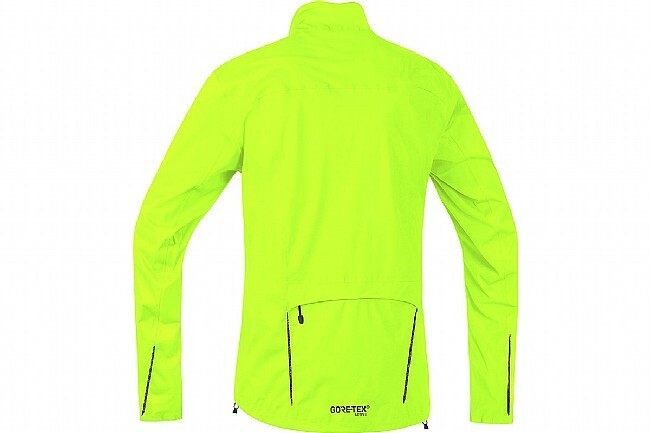 Since it is a high visibility daytime jacket for night riders (myself) some very high reflective material on the back would provide a cushion of safety. Overall it is very much worth the money. Awesome jacket for northern California riding. This jacket makes water bead up & sweat evaporate. I wear this daily in the Portland, OR rain. It's very bright and just the right weight. I've been wearing it most days for the past month and a half. So far, so good.